In which there was a ‘YUM’ hidden in the unchecked squares (unches) on each of the four sides and ‘Reluctant Cannibal’ hidden at 11a/ 18d. Mean anything to you? Well the latter is the title of this song by Flanders and Swann from 1956, which includes the line “a chorus of yums ran around the table”. Ho! In fact F & S’s career overlapped with The Beatles and The Stones, but to me they seem to come from another age somehow – even if I do remember ‘I’m a G-nu’ from my childhood and I dare say we all know their song, ‘Mud, Mud, Glorious Mud’. Anyhow, Phi is clearly a fan. As often happens when there’s a Nina, the difficulty was upped a few notches; I failed to parse 18a, didn’t know ‘bam’ was a hoax in 23a, didn’t know a maul was a hammer in 4d, and in 10a we can all be forgiven for not seeing how ‘Stock’ defined ‘Grim’ – apparently it was a typo for ‘Stark’. Why does that only ever happen with Phi? Click here to see the original blog by the 23a John. Another puzzle that I found to be a little on the tricky side, especially in the NE corner where I spent an absolute age. Are they just harder this week, or have I completely lost my touch? I’d guessed the fuel supplier but couldn’t justify it, struggled to think of the diarist required for the wordplay of 10ac (and as previously mentioned geography never has been my strong point), and, well, birds. No complaints, though, because eXternal is always good value for money, with lots of good, inventive clues, the aforementioned 7ac and 24d leading the pack. We have an update at 25ac, as you’d probably already guessed. First in a slightly panicky somewhere down the bottom of the grid, last in 15ac, finish time well above par for the i.
COD? 2d – “Interrupted twice by posh character, one who despises arrogance (7)”. So a slighter tougher challenge than we’re used to on a Wednesday, but one that was consistently entertaining, it being Punk. Getting 1ac at a first glance and then making fairly good progress in that corner of the grid raised hopes of a swiftish solve, but the RHS in particular took a fair bit of unpicking. Perhaps trying to solve with half an ear on a work call wasn’t the best approach. I didn’t know 4ac and needed a fair few checking letters to get her name – only one safe was ever going to fit, but there are a lot of gods to pick from. The parsing of several others – notably 17ac – eluded me, but no doubt that was down to lack of concentration. Or in the case of 19ac a steadfast refusal to acknowledge that it’s almost that time of year again. Finish time then above par for the i, but maybe not what I’d expect for Punk. COD? For me it’s got to be the quite remarkably well hidden 24/8 – “Attacking force stopping tearaway Nero, one yielding (5,6)”. The prize for blind-blowing preamble of the year goes to Phi. Moon phases, apparently. Now, I can’t say I know a great deal about the things, but we seem to be missing the second quarter. Perhaps that’s right, I don’t know. The wordplay? We need to lift and shift large chunks of the resulting letters. The numbered clues? Something to do with the remaining phase. Which sort of makes sense through the mind-fog that is Saturday afternoon and indeed most of the rest of the weekend. What’s the point of a soft drink and early night if you’re still going to feel like death the next day? But onward, and how to go about solving the thing? Well, a few of the “normal” clues make sense. So BAALITE, for example. But I’ve got absolutely no idea how to go about solving the rest. Especially the ones in quarters. Definition. Tick. Wordplay. Well, we haven’t really, have we? So what to do? OK… “letters and figures” in the full group is surely ALPHANUMERIC? And I can sort of see a couple of bits of wordplay that might relate to the answer. The rest, obviously, isn’t supposed to. But it’s got to fill one whole column or row of the grid, and we’ve got CUE at 29ac… In it goes. So apologies to Phi and our editor for the shabby way in which I treated this week’s offering. Next week’s a new setter according to Nimrod who seems to be in the middle of a protracted pub crawl judging from his tweets. Let’s hope we can do them both justice. Here’s more shift work from The Fall. 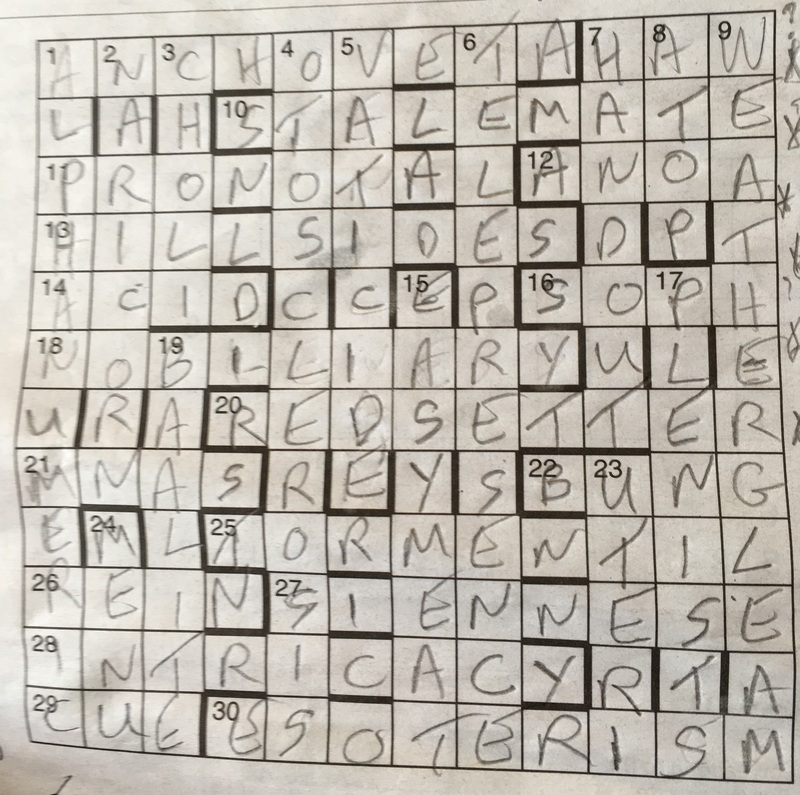 Another day, another crossword with complications, but this time it’s set by one of the masters of jiggery pokery which makes all the difference. No Nina today (despite the grid – which incidentally integrates the four quarters unlike yesterday’s), but there’s a rather familiar theme. Anax did something similar in March, I think. Good blog from Bert and Joyce plus mixed reviews in the comments over at Fifteensquared back in June 2014. COD? Slim pickings here as you might have guessed from the above, but I’ll go with 15d – “One may contribute coyly to a four-letter word (8)”. Four long entries in the grid, four long anagrams in the clues. Which is a good way to kick-start a puzzle if you’re solving or, for that matter, if you’re compiling. Mind you, there’s always the danger of ending up with a word like ‘sawdusty’ in one of the corners – hmm. I always admire Phi for his prolific output, but with that comes an almost inevitable ‘workaday’ feel to some of his puzzles, which is how this felt to me. Reasonably straightforward by the standards of the i, which will have made it popular with many, but not as exciting or interesting as we’ve had over the last few days, I’d say. Apparently there’s something going on to do with Isaac Azimov, but I didn’t actually take the time to find out what, sorry. And the original 2014 blog with all the answers can be found by clicking here. Sprouthater’s off sampling the local brews up north leaving me the pleasure of blogging our second prize puzzle reprint of the week. And yes, it’s another good one. Perhaps not as approachable as yesterday’s – more than a few went in on a bit of a wing and a prayer, notably 1d and some of the longer answers where I basically looked at the wordplay and thought – to hell with it. But in they all went, and at the close not only were they all present but correct as well, much to my surprise. First in today was 10ac with a bit of a gift from Tyrus – flashy jewellery invariably equates to bling, leaving little doubt as to the answer with that enumeration. Last in 23ac, which is one where, with all the checking letters, it could be little else, but where I was left floundering for a word with an anagram of “set” among the letters. Weren’t you? Finish time above par for the i, but less than I’d expect to spend on a Saturday reprint. COD? Lots to like, with 1ac in particular having a number of ticks by it. But as it’s an obvious one once you’ve got the first letter, I’ll go with my other top pick, 16ac – “Bases discourse on a table (11 x 2) (7)”. In which we must have a leading contender for puzzle of the week. This is a Saturday reprint so as expected the difficulty level is cranked up a little, but this was as accessible and enjoyable as you could hope. And the setter being Nestor all the clues are of top notch quality. All the X’s and that Q in the grid led me to believe we were looking for a pangram which slowed me down somewhat on my LOI – 9ac – where I was looking for anything other than the, as it turns out, obvious. The X’s and Y’s down the RHS do make me wonder if there might have been a stab at a mini-theme going on, perhaps in conjunction with 11ac, that was later abandoned, but on the other hand that could just be the work of my fevered imaginings. And work being about as work-like as it could be today, that is entirely plausible. Today my brain hurts and not because of the crossword. First in 4ac, last in already mentioned, finish time just a little above par for the i. Many more like this please. COD? Just because I felt quite frankly more than a little smug when I solved it without recourse to a dictionary, 6d – “Gazella gazella is one possible signature for A Minghella on letter from Greece (8)”.